Capture and organize your library of sound effects, beats and loops. Is there a better alternative to Cellar? Is Cellar really the best app in Audio category? Will Cellar work good on macOS 10.13.4? 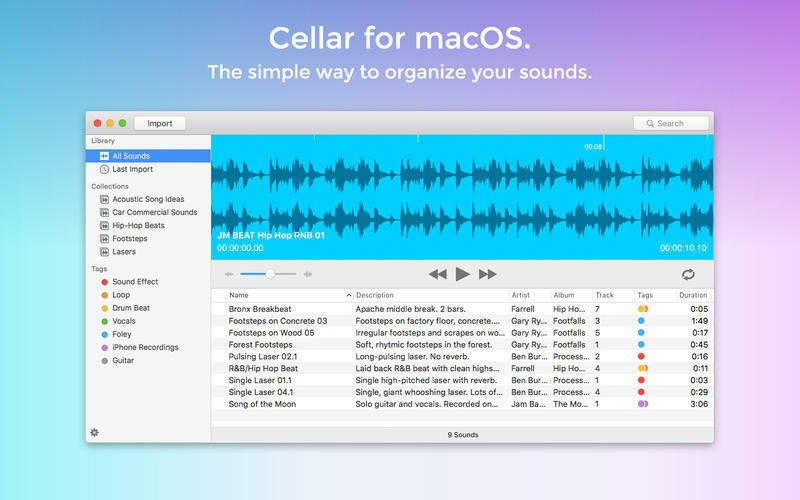 Cellar is the missing sound assistant for OS X. Cellar will capture and organize your library of sound effects, beats and loops. Built for editors, sound designers, musicians, podcasters, producers and sound professionals, you will spend less time managing media and more time creating. When you need a sound, simply pull it up in Cellar and drag it into your favorite audio application. Touch your waveforms: seek and scrub your audio during playback. Play, pause, skip and toggle looping without lifting your hands or memorizing hot keys. Start searching with a single tap. Fixed a macOS permissions error when consolidating some files. Cellar needs a rating. Be the first to rate this app and get the discussion started! Fast Sound Retrieval - Stop digging through endless folders to pull up that perfect sound. Cellar’s blazing fast search will find the sound you need. Any descriptions or metadata you enter will come up in the search. Quick Audition - When you’re looking for inspiration, quickly audition all of your sounds and use the visual waveform to seek to the right spot. Not the sound you want? Tap through your library while the sounds keep playing until you find what you're looking for. Effortless Organization - Sort your sounds into Collections and apply Tags. Your library becomes sortable and searchable without spending massive amounts of time editing metadata. Your Files, Managed - Capture all of your audio files into one place. You have the flexibility of letting Cellar handle all of your files, or you can leave all of your files in place and Cellar will serve as your librarian. Drag-and-Drop Spotting - Once you’ve found the sound you need, you can get it into your cut with a simple drag and drop. Compatible - You can use Cellar alongside any audio or video editing application that supports drag and drop import and editing. Relinking media from the Preferences window will now refresh the offline media in the sound list. Fixed the window size not getting saved between launches at random times.